Browsing the archives for the Presidential Elections category. The New York Times has an article today called, “How The Movies Made a President,” (which includes a cool slide show). It examines various black archetypes in movies and TV and how they may have helped to prepare the ground for the ascendancy of Barack Obama. I had similar thoughts a few months ago but never got around to making a blog post out of ’em (I know, all the bloggers say that, right?). The article mentions Dennis Haysbert and the show “24” in passing — that was the starting point of my train of thought earlier. I think the significance of that show is not only that it was popular and that the black President Palmer was a good guy, someone the audience is rooting for, but that Keifer Sutherland’s character Jack Bauer is a pretty Republican character, at core. He’s all about stoppin’ those damn terrorists by any means necessary. This wasn’t some lefty liberal show, at all. I started thinking about this after seeing a Dennis Haysbert commercial for State Farm. He’s all calm, reassuring authority. I saw the commercial soon after some sort of political television — a debate, perhaps — and I thought at the time that it had to help Obama. There are just all sorts of resonances there. The phrases I transcribed from the commercial at the time were, “If this isn’t a recession, it sure feels like one,” (spoken wryly but seriously by Haysbert, standing in a grocery store) and then the standard State Farm tagline; “Are you in good hands?” Haysbert’s hands, the commercial clearly implies, are very good ones. The presidencies of James Earl Jones in “The Man,” Morgan Freeman in “Deep Impact,” Chris Rock in “Head of State” and Dennis Haysbert in “24” helped us imagine Mr. Obama’s transformative breakthrough before it occurred. In a modest way, they also hastened its arrival. I’m starting to see Obama being held up as an indication of how advanced America is compared to other countries when it comes to race relations. On the one hand that’s so awesome! Yay us! I do still get this little shock every time I realize that it’s actually true, and what it means. On the other hand, it’s a bit too easy and pat. The fact that Obama was elected doesn’t mean that America no longer has any problems with race. 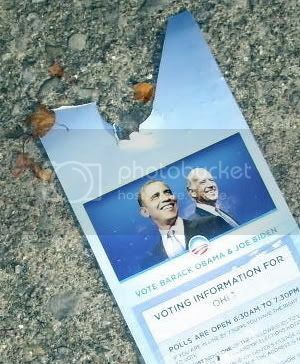 I took this photo of a voting information flier on the ground on election day. I’ve been interested in politics forever but this election year was one for the ages. And all of that excitement wasn’t even crammed into a single election year — candidates announced that they were running for president about two years before election day (of the major candidates, John Edwards was first in December of 2006, and Barack Obama was last in February of 2007), and there was speculation and buzz well before anyone announced anything. All told, this election cycle took up about three years of my life, with the intensity ratcheting up and up and staying at fever pitch from about the Iowa primaries (January 2008) through election day. So perhaps it’s unsurprising that after the initial euphoria of election night, I’ve settled into a period of politics detox. I no longer obsessively click on the acronymed sites crowding my bookmarks toolbar (TPM, FR, DD, WM, 538) — several of them haven’t been touched since November 4th. I still read my daily New York Times but I glide over the politics and intrigue and pay more attention to the arts section and special sections like Science Times. The TV stays away from CNN and MSNBC and C-Span. I believe this has been better for my mental health — but man, that was sure a fascinating election cycle. I can sense that things are starting to change already. For one thing, I am so watching the inauguration. My daughter has the day off of school (hooray!) and we’re gonna make a day of it. That’ll invite CNN back into my living room, and I’ll want to see what Kevin Drum and Andrew Sullivan and Matt Yglesias and Hilzoy and everyone are saying about it. And I’ll disagree with some of it, probably, and write them emails and write stuff here and then see the counterarguments and that’ll probably be that. Detox completed, politics part of my brain re-engaged. In TNR, Clay Risen revisited the question of voting patterns in the South in this year’s presidential elections, and responded to a point of criticism I raised here on his previous take. Being an incurable nitpicker, I’m still not altogether convinced. The former is certainly a good point. My own stab at electoral analysis here highlighted how the Gulf states and Atlantic states seem to be heading down different paths altogether. But the latter point has a problem or two. OK. I’m Starting To Believe It. The other day I clicked to Comedy Central, just to see what was on. Barack Obama’s smiling face filled the screen. The camera panned to show fireworks behind him, then out to show that he was on a porcelain plate. The words “Change Has Come” in scrolly gold letters were lingered on lovingly. Everything was soft-focus and precious. There were no captions and I squinted at the screen in confusion… was this some sort of Jon Stewart parody? What was going ON? Eventually it became apparent that despite the insipid-looking white people gazing happily at the plate and the lo-budget schmaltz, this was the real thing. They’re actually selling porcelain plates commemorating Barack Obama’s victory. This can be YOURS for the low, low price of $19.99!! There is a whole site set up for selling these plates (and coins! ), where you can watch the video (slightly altered from the one I saw — fewer insipid people, more coins). I remember when I ordered my “ObamaMama” t-shirt, more than a year ago. It’s a very nice t-shirt, as t-shirts go; black with red white and blue lettering and an Obama logo. I never seemed to make the decision to wear it lightly. I’m relatively new in town and I had serious concerns about whether wearing that t-shirt would close some doors for me. When I did wear it, the reactions tended to be strong (especially once the primaries got started). I wore it to the Ohio State Fair in July and a young black guy grinned at me and said “I like your t-shirt…!” while a middle-aged white woman glared at me with such heat that I prepared to physically defend myself — she eventually moved on, though. This commercial somehow brought home for me that Barack Obama is not the risky candidate that I started supporting almost three years ago. He’s our President-Elect. Three quarters of Americans think he will be a good president. His face is on tacky porcelain plates, for chrissakes. This is real. 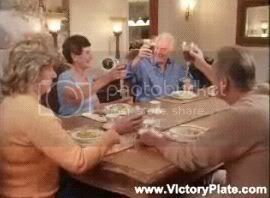 A toast to our President-Elect, Barack Obama. … in Kenya, that is. People are saying, “We won.” Talk show hosts are joking that the fish in Lake Victoria are getting stake because all the fishermen are watching TV. The radio is playing Obama songs in Luo [..]. “George Bush said only John McCain could lead America,” goes one particularly jaunty guitar-and-drum tune, “but the rest of the world said no.” [..] President Mwai Kibaki declared Thursday a national holiday. Less than a week after the election, you can’t walk 10 feet in Nairobi without seeing Obama’s name. [Y]ou can buy Obama campaign buttons in the supermarkets, beaded Masai bracelets with “Obama” stitched into them [..], souvenir Obama hundred-dollar bills, mini U.S. flags bearing Obama’s face, [..] electronics at one store’s “Obama sale” (not sure what this means exactly) — and the list goes on. While I appreciated Kenya’s election-day euphoria as much as the next guy, with the inauguration still 10 weeks away Obama already risks becoming a cliche here — not unlike the endless Man U and Arsenal logos that plaster all the minibus taxis. This is what’s almost happened in South Africa to Nelson Mandela, whose family has tried unsuccessfully to keep his face off of every T-shirt and backpack going. Obama’s not there yet, but it’s coming.